What’s the difference between dog food and cat food? 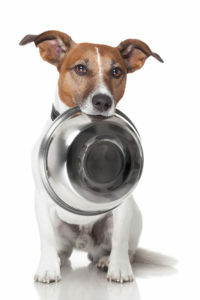 There are many discussions on what dogs should eat, and many views on which food is the best. That aside, dogs are physically able to digest carbohydrates and can get nutrition from plants. Cats can only get certain vitamins and amino acids through eating meat. In nature, you normally don’t see carnivores living off a steady diet of other carnivores. This is because animals who live off plants can convert substances such as Arginine, Taurine, and active Vitamin A, while the obligate carnivores must get it already converted by some other animal. When it comes to pets, a steady diet of cat food might be too rich for a dog in the long run, but a few bites won’t cause disastrous consequences. A cat on the other hand should not eat dog food. Even a little dog food can fill the cat up to the point where it doesn’t get enough of its own food. Cats need to, for instance, get Arginine – a building block for proteins – with every meal.